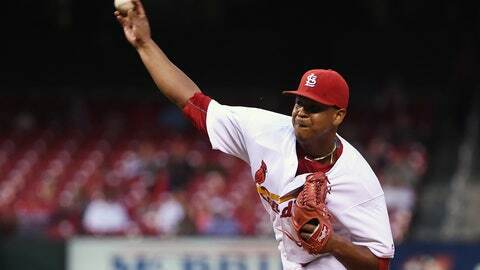 St. Louis Cardinals right-hander Alex Reyes, one of the top pitching prospects in baseball, reportedly underwent an MRI today after feeling discomfort in his elbow. As St. Louis Cardinals spring training officially gets underway this week, the status of one of the team’s most exciting young players is suddenly unclear. Pitcher Alex Reyes underwent an MRI on Tuesday after reporting discomfort in right his elbow, according to MLB.com’s Jennifer Langosch. General manager John Mozeliak emphasized caution, stating that he wasn’t aware of any specific injury concern in regard to the 22-year-old right-hander. “Rather than speculate on anything now, it’s best just to wait until tomorrow when we get the [MRI] read,” he said, per MLB.com. Cardinals manager Mike Matheny added that there had to be a “significant reason” for Reyes to undergo the scan, but didn’t speculate beyond that. Although no one can say for sure at this time the degree of concern surrounding Reyes, the situation has to be unsettling for the Cards and their fans. To further fan the flames, Jeff Passan of Yahoo Sports reports that there is “significant concern” within the organization that Reyes will ultimately need Tommy John surgery. It’s safe to say Cardinals Nation is holding its collective breath. Reyes is one of the most highly-touted young arms in baseball. He is currently ranked as the game’s sixth-best prospect by MLB Pipeline. After making his major league debut as a 21-year-old last August, Reyes was very impressive down the stretch for St. Louis. Over 46 innings, he posted a sparkling 1.57 ERA and 1.22 WHIP while striking out batters at a 10.2 K/9 clip. He made five starts and seven appearances in relief. With his rookie status still intact through 2017, Reyes figures to be one of the early contenders for the NL Rookie of the Year Award. The Cardinals are also counting on him to provide a jolt of talent to a rotation that largely underwhelmed last season (4.33 ERA, 13th in MLB). Newly-extended Carlos Martinez is expected to lead the staff, but an aging Adam Wainwright, mediocre Mike Leake and Lance Lynn returning from Tommy John surgery all come with legitimate question marks. Of course, those infamous letters – TJS – are the worst-case scenario the Cards are desperately hoping to avoid right now with Reyes. Much has been made in recent years about a perceived uptick in pitchers requiring the surgery, particularly young hurlers who throw especially hard. Reyes would seem to fit into that category: His fastball sits in the mid-to-high 90s and can break the 100-mph mark. When you hear that he felt discomfort in his pitching elbow, your mind can’t help but wander to that possibility. For now, the Cardinals will wait and hope for the best, and it’s important to stress that there has been no official indication yet that Reyes’ issue is severe or that he is in danger of missing time. Fans of the Redbirds would like nothing more than for this to ultimately be a precautionary measure, and for Reyes to take the mound this spring after perhaps only a minor delay. Information regarding the MRI results is expected tomorrow.